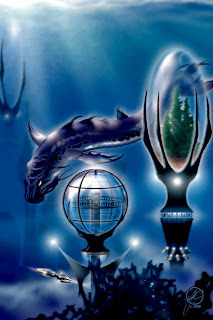 Last year, through our Corporate platform, the League of the New Worlds, we designed a manned undersea habitat system that could be launched for 48 hour weekend undersea excursions. It was called the Leviathan. Later, the Atlantica Expeditions were launched in which we were planning to use the Leviathan habitat as a part of the expeditions. As the Expeditions were being developed, the floor plan and design characteristics of the Leviathan began to change significantly to meet unfolding mission requirements. It has now passed beyond the point that it is a trailerable or a weekend endeavor. Hence, the habitat no longer qualified as the class of its original design. Therefore, we are now swapping habitat names. The trailerable weekend habitat is renamed the NEW WORLDS EXPLORER I or the NWE-I and the Atlantica Expeditions I habitat has been named the LEVIATHAN.